John McCain has 3 media appearances. John McCain discusses Why Courage Matters. The United States Senator and 2008 Republican presidential nominee visits with his history of Americans at war, told through the personal accounts of Thirteen Soldiers who fought in pivotal wars throughout history. As a veteran himself, a member of the Senate Armed Services Committee, and a long-time student of history, John McCain brings a distinctive perspective to this subject. Thirteen Soldiers tells the stories of real soldiers who personify valor, obedience, enterprise, and love. You'll meet Joseph Plumb Martin, who at the tender age of fifteen fought in the Revolutionary War; Charles Black, a freeborn African American sailor in the War of 1812; and Sam Chamberlain, of the Mexican American War, whose life inspired novelist Cormac McCarthy. Then there's Oliver Wendell Holmes, an aristocratic idealist disillusioned by the Civil War, and Littleton "Tony" Waller, court-martialed for refusing to massacre Filipino civilians. Each account illustrates a particular aspect of war, such as Mary Rhoads, an Army reservist forever changed by an Iraqi scud missile attack during the Persian Gulf War, and Monica Lin Brown, a frontline medic in rural Afghanistan who saved several lives in an ambushed convoy. From their acts of self-sacrifice to their astonishing bravery, these Thirteen Soldiers embody the best America has to offer. EVENT DETAILS TICKET (admits two) is free when you purchase Thirteen Soldiers from Changing Hands Bookstore. Letter groups (printed on top of ticket) will be called at 6pm to fill seats and designated standing room. If available, seating and standing room opens to those without tickets at 6:45pm. Space cannot be guaranteed for late arrivals. Booksigning line forms by assigned letter group after the presentation. Those without tickets may get their books signed after ticket-holders, if time allows. Event details may be subject to unannounced changes. ABOUT THE AUTHOR SENATOR John McCain entered the Naval Academy in June of 1954. He served in the United States Navy until 1981. He was elected to the US House of Representatives from Arizona in 1982 and to the Senate in 1986. He was the Republican Party's nominee for president in the 2008 election. John McCain is currently considered a "single author." If one or more works are by a distinct, homonymous authors, go ahead and split the author. 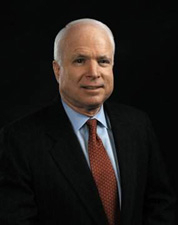 John McCain is composed of 7 names. You can examine and separate out names.